It seems that the PBMining Bitcoin cloud mining service may finally have an interesting alternative for people that are interested in purchasing Bitcoin cloud mining hashrate. Not that so far we’ve had any problems with that service for the last 4 months we’ve been using it, however we still do have some concerns as some people also do. The biggest concern is that the Canadian guys operating that service do remain quite anonymous and do not reveal much information about their mining operations. In the world of crypto currencies anonymity is important for the miners, but when somebody wants to take your money (or hard earned coins) you would want to know a bit more about that person or company in order to have enough trust in them. So for the people concerned there is now an alternative called Bitcoin Cloud Services operated by a company based in London, UK. This service apparently does try to copy the same model for offering Bitcoin cloud mining services, but they do try to be more open to their customers and not remain anonymous. 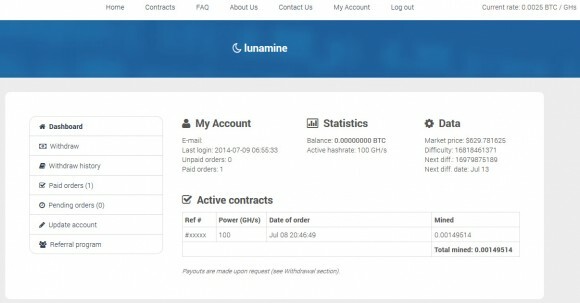 We need to mention that this new company that apparently started their cloud mining operations in March this year has not been very actively promoting their services until recently. The most interesting thing however is that they are currently offering pretty much the most attractive price per GHS of Bitcoin cloud mining hashrate. Currently Bitcoin Cloud Services offers 5 year contracts fro Bitcoin cloud mining with the hashrate going at 0.0034 BTC per GHS. There are no additional fees for maintenance, electricity or pool fees that you need to pay and they do have daily payouts of the coins earned with your purchased hashrate. 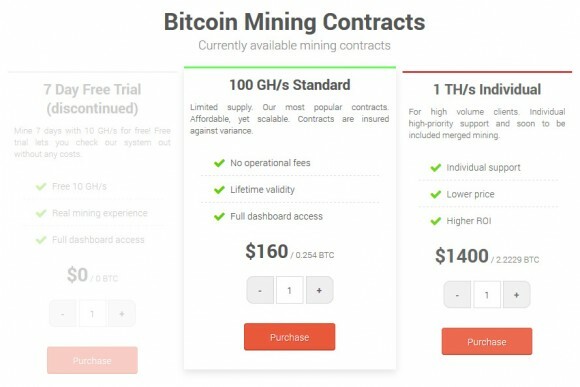 As we have already mentioned this does seem very similar to the terms offered by PBMining, though the price per GHS here is a bit cheaper and you get daily payouts instead of weekly ones, so some other advantages besides the fact that the service is not anonymously operated. When we see long term contracts such as 5 year ones available at a very good price we do get a warning light on, so we do recommend to be cautious. 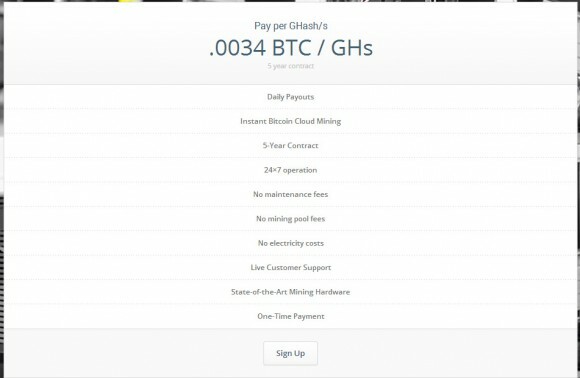 We have decided to give the service a try and have purchased 10 GHS, the minimum you could purchase, though a day after we have payed for our mining contract the minimum hashrate that you can purchase has been increased to 20 GHS. We have paid 0.034 BTC for the 10 GHS, though now the minimum you need to spend to try the service is double that amount or 0.068 BTC. Based on the order number we got, we should be around the 500th customer of the service, though if not all orders have been completed the number of actual customers could be less and the actual orders could have started with a higher number than 1. Our order was placed on June 26th and paid in Bitcoins – you have to pay only with Bitcoin and you can choose between BitPay and CoinBase. 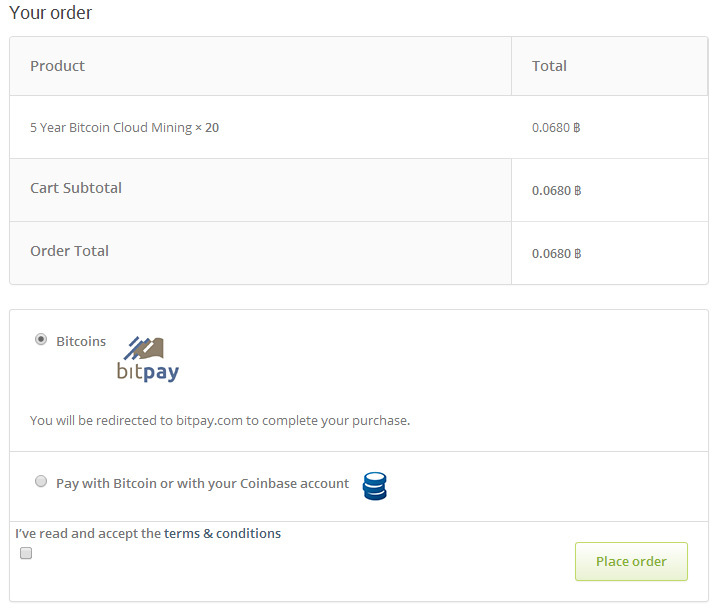 About an hour after we have made the payment our order has been marked as completed and the mining has started based on our purchased hashrate. We got an estimate on what our first daily payment will be and the date for the first payout was shown as 28th, as apparently we have made the order near the end of the day on the 26th. Yesterday we have received our first daily payout and it was exactly 0.00041279 BTC. Doing a quick calculation has shown that if the Bitcoin network difficulty remains the same and the daily payout is also the same as the one we got the first day we are going to need a little over 82 days to get back what we have spent for the mining contract. We know however that the actual time needed will be more as the network hashrate is steadily increasing over time, but still the time for return of investment should be estimated to something like half an year. So things may not look so bad if you are interested in long term Bitcoin cloud mining contracts, and you might want to check out the Bitcoin Cloud Services. What we need to note from our still short experience with the service so far is the fact that you are setting the BTC payment address prior to making an order and you cannot directly edit it from your profile, you need to contact the support to change it. This is apparently a means to make things more secure, but can also be inconvenient should you need to change the address for some reason. Also the service needs a bit of work on the features available in the user account, namely some information about past payments as well as total payments as currently you only get information about the last payment you got. Furthermore some work is needed on the overall reporting of purchased hashrate and earnings, as currently you get some very basic information and you need to enter every contract information page for this. So this is the key thing that needs some more work, the user account backend could be improved to be more user friendly and informative. An important word of advice though, we have just started testing this service and although it seems quite transparent and legit at first look, as usual we do recommend caution! If you are interested in trying it out always start with a minimum investment and with something that you can afford to loose if things go bad. 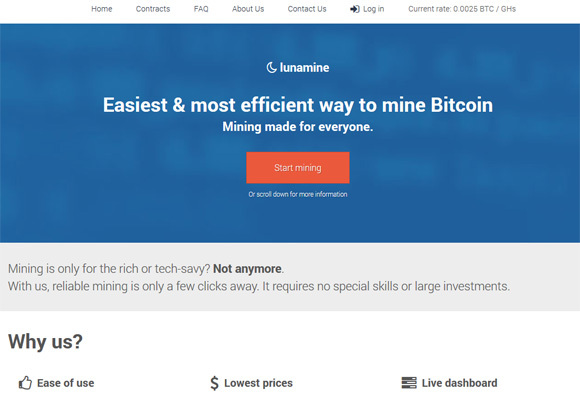 As we have already mentioned the company apparently started in March, however it seems that their real could mining operations have started sometime earlier this month. A a little over a week ago they have made an official announcement topic at Bitcointalk (June 19th) and on the next day they have made an announcement of becoming a silver member of the Bitcoin Foundation. This and the fact that they have posted on their Twitter and Facebook accounts since May essentially does bring some confidence, along with the publicly available information about the company behind the service, but there are still some concerns. We are going to continue using the service and will be reporting how things progress with it as well as our own experience using the service. Update: It seems that the Bitcoin Cloud Services is no longer paying users since June 7th 2015, so do not purchase anything from them as their website is still available and accepts payments!